Where should the choir stand for performances? 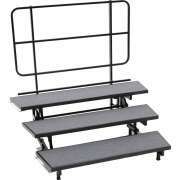 Choral risers are key when you have a chorus or group of performers. They allow those in the back row to be seen and heard as much as those in the front. Our collection includes several different styles and shapes so you can find one that meets your needs. 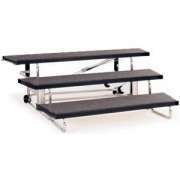 Our band risers are easy to set up and put away. 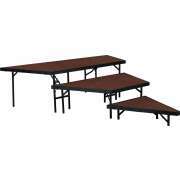 Their budget-friendly prices and durable construction make them an excellent choice for any school or church. 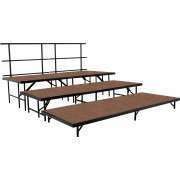 Great risers can make an amateur choir feel like the professionals and demonstrate your institution&apos;s high regard for performance and music. 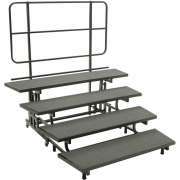 Which choral risers are easiest to set up? 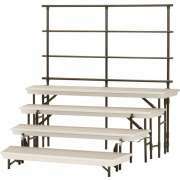 When your chorus or band gives a performance, you don&apos;t want to waste time worrying about the choral risers. 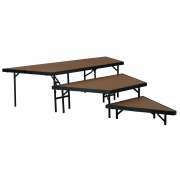 All of our portable risers can be set up and cleared away very quickly, so they won&apos;t take up too much time or effort. 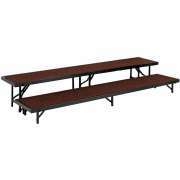 Transport Folding Risers from National Public Seating have an exceptionally convenient design. They fold up compactly in one piece and roll away easily on built-in wheels. This means you can get the into place easily and save space in storage. Even if your choir risers don&apos;t have built-in wheels, you can still move them easily. If you don&apos;t want to drag, carry or roll risers into storage individually, we have an excellent solution. Riser caddies accommodate multiple units so you can easily transport an entire set or configuration into and out of storage. This convenient arrangement saves both time and manpower so you can get your performances going quickly. 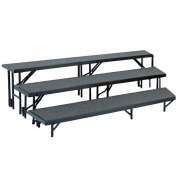 What kind of portable risers should I get? 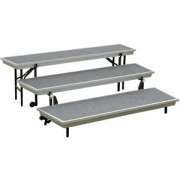 Portable risers come in individual units, multiple-levels or complete sets. 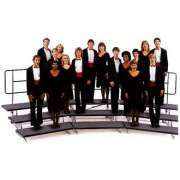 We offer both tapered and straight-edge choral risers. Tapered risers can be arranged in a curved formation. A U-shaped formation allows singers to easily hear each other so harmonies will stay in time, and a blended sound is achieved. 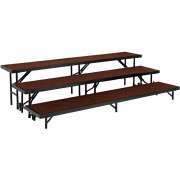 This is a great setup for church choir stage risers. Pie-shaped configurations are available as well. This option keeps the audience&apos;s eyes trained toward the center. The ideal height, width and length of your risers depends on what you are using them for. Band risers are wider than choral risers because they are meant for seated performers. For a small ensemble, you may choose to just have one raised level, while you may prefer up to four staggered levels for a full chorus. 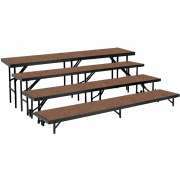 The length of your risers determines how many performers can sit or stand on them. 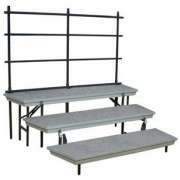 If you need more space, many of our risers have built-in ganging so you can easily attach them to additional units to accommodate more musicians. How can you make sure no one falls off of the risers? You want to make sure that your stage risers are safe, especially if they are being used to promote music in an educational environment. 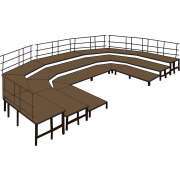 Some of our models include back guard rails to ensure that the performers in the back row remain balanced and will not accidentally fall off. We also offer optional back and side rails for many models which can be ordered separately according to the arrangement that you choose. When musicians feel secure and protected, they can focus on the performance rather than worrying about accidents or injuries. 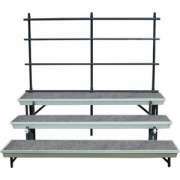 We have choral risers with two different choices of platform materials. You can choose from a number of carpeted or hardboard options. Carpeting is great for musical performances because it muffles the sound of shuffling feet and moving chairs. It is available in a number of elegant hues that can be coordinated to the colors of your auditorium, social hall, chapel or gymnasium. 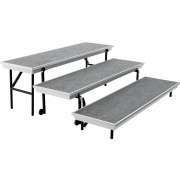 Hertz Furniture has great band risers for any performance space. 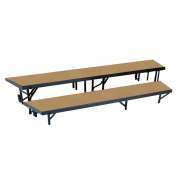 Our models come from top quality manufacturers including National Public Seating and Midwest Folding Products. This large and varied selection offers you a number of excellent options that will showcase your musicians in style.